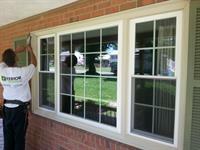 Exterior Source is a Class A contractor specializing in the installation of gutters, siding, roofing, windows and doors. Established in 1993, we've served more than 21,000 customers throughout Central VA and Tidewater. We are the exclusive home of LeafGuard gutters. We are also a GAF Master Elite Roofer, a CertainTeed 5-Star Contractor in vinyl siding and trim and a Soft-Lite Windows Certified Installer. Our office is located in the Chesterfield Airport office complex off at Rt 10 and 288.